Is Target the New Hobby Shop? Home » Sports Collectibles Industry » Editorials » Is Target the New Hobby Shop? I can already hear the collective gasp from the collecting universe. However, let me explain. This thought started when I posted a picture to Twitter last week of a recently closed hobby shop in my area and someone replied that, "Whenever Chris Olds (famous for his Ripping Retail posts) or other collectors buy product from Target the sound you then hear is another LCS (local card shop) closing its doors for good." To some degree, I understand the sentiment. However, it's not that simple. Trading card manufacturers exist for one reason: to make money. While the perils of card shops has been well documented, the truth is far more complex. The majority of the time I go to a hobby shop, I am greeted with a disorganized store, over-priced singles and a limited supply of over priced wax. I've met few exceptions. It's not exactly the experience most collectors are looking for, and even less so for the casual collector or soccer mom with a child wanting to get into the hobby. Contrast this with the obligatory card aisle at your local Target. Most of them are fully stocked with the newest product at multiple packaging and price points. Conveniently, they even sell supplies like penny sleeves, top-loaders, sheets and albums. People go to Target and Walmart more often than not for items other than trading cards. However, more potential customers pass the display at your local Target in a single day than a hobby shop will see in an entire week or more. So if you are a trading card manufacturer, where would you position your product? At a thriving chain of retail stores or in dwindling hobby shops? It's a rhetorical question, obviously, because the manufacturers rely heavily on card shops for promotion and sales. But if the truth were known, I'd be willing to bet retail outsells hobby consistently across the board for every product that is not hobby exclusive. I'm not hear to bash hobby shops. Not by a long shot. But without better, competitive pricing and incentives what's the point of collectors going out of their way to find a hobby shop? The camaraderie and social interaction of being with fellow collectors? Please. There's plenty of other ways to get that. Pack wars? Boring. Trade night? Not when "book-value" is involved. Autograph signings? I'm not waiting in line for some second-rate prospect or retired has-been. To sort through 5,000-count boxes of singles to set build. Thanks anyway. I'll place my order at Sportlots while I watch Pawn Stars from the comfort of my home. I would love to own a card shop. Yes, you heard me correctly. But only so that I could use it as a way to write off expenses, get retail distributor pricing and put my money where my mouth is about what it takes to run a successful hobby shop. So what are some of these ideas? 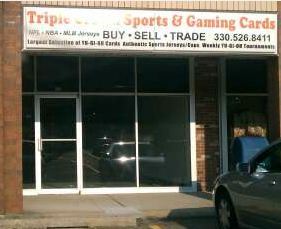 Combine sports cards, the top 25 comic books and gaming into a single shop. Diversify product lines further by carrying NASCAR and Indy die-cast collectibles and McFarlane variants. Learn how to, or hire someone who knows how to, do custom framing for jerseys, collages and photos. Buy a pack get one for 50% off all products $4.99 and under. Hold a fantasy football draft, box break style. Each participant's team consists of the first player at each position pulled from a pack of Topps Football. Get one of the manufacturers to sponsor the event with a high-end box for the league winner at the end of the regular season. Match competitor and online pricing. This should be easier to do than ever before as restrictions from several manufacturers have recently placed the online marketplace and retail brick and mortar shops on a more equal footing. Be open when your customers shop. 12-8 Tuesday to Thursday and until 9 or 10 PM on Friday and Saturdays. Give back. Free cards with every purchase over $20. Those commons boxes are just collecting dust anyway. Diversify pack offerings by carrying blasters and rack packs. Make your own 100-count re-pack boxes. $5 gets you 99 random cards and a game-used card, $7 for one with an autograph or $10 one of each. Offer a consignment service. You sell customers' cards on eBay with a 25% surcharge plus fees. Truly integrate your marketing by selling online and leveraging social media. Liquidate aging stock with a monthly live auction and pizza party. Keep a door counter and every 100th customer gets 15% off their purchase. Carry Beckett but with a sign saying, "Thou Shalt Not Trade By Book Value Alone". I could go on and on. Maybe I am out of my mind but I truly believe that you can sacrifice short-term dollars for long-term growth. You may have a lower initial profit margin but your customer base, as it grows, should compensate for some of the money you leave on the table. So is Target the new hobby shop? Hell, no. At least not yet. 2017 Topps Dynasty AUTO Letter Patch Corey Seager Autograph 2 10 Very Cool!! the shop does some of the things you mentioned including sell for customers on ebay. But they also have a CASE break each month with normally 1-3 new products and provide Pizza and Drinks for participants. They also will work with you on box/single prices if your a good customer. I happen to own a hobby shop and your rant has some truth and a lot more fiction. Your pipe dream of owning a store would fail miserably as I can tell you don’t know cost of doing business. Your thoughts on the way some archaic card shops do business is valid but you are not knowledgeable enough to truly comment on the state of how to own/operate such a business. I am guilty. Target has become my LCS. I live on an island with no LCS and am rarely ever stationed in a city with one (anymore) so Target has become the defacto LCS. I believe there is a place for both. My preference will always be to an LCS, if i can find one. @jeremy brannon, i live in Texas too. I love SMP sports cards. Its probably one of the best card shops i have ever seen. He comes dowm $20-$30 on boxes if i ask. The owner is a great guy.